At the beginning of the April war, only 6 out of 12 IK-3 from the first production series were operational. One aircraft was lost in a fatal accident before the war (it dived into the Danube River under power; investigators concluded the pilot had blacked out), four were grounded for scheduled services and repairs and one aircraft was undergoing modification to Series II IK-3 standard in the Rogozarski airplane factory. The six remaining IK-3s were assigned to 161st and 162nd fighter squadron (3 IK-3 each) of the 51st Fighter group. The 51st fighter group was part of the 6th fighter regiment of Royal Yugoslav Air Force which was tasked to defend Yugoslav capital, Belgrade. Both fighter squadrons were stationed at Zemun airport. One source states: " . . the IK-3s put up a valiant resistance against the Luftwaffe, scoring a number of "kills" before they were finally destroyed in combat." Another source claims 11 victories for the IK-3, with Narednik (Flight Sergeant) M. Semiz as most successful (4 victories). Molded in AZ Model's usual tan plastic, there is a single injected plastic sprue with a rather thick one-piece canopy. The molding on the plastic parts is quite good with nicely engraved detail. The fabric representation is along the line of having thin raised detail which on the left fuselage side is of an inconsistent nature. The rest of the parts are typical of low pressure molding. Apparently this sprue is used for the later version as well as there are two sets of gear doors provided, about the only external difference between the two types. There are wheel well sections that are cemented into the lower wing. Cockpit is the usual flat floor plate with separate seat, instrument panel, rear bulkhead, stick. 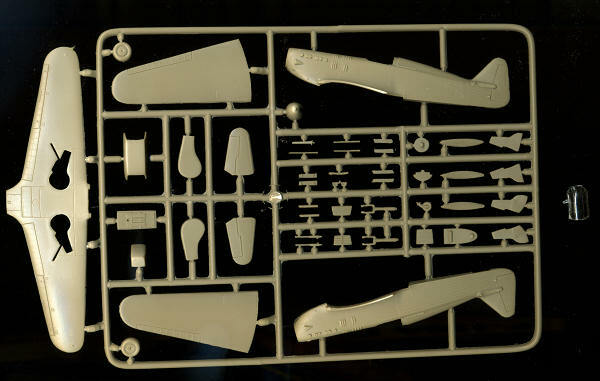 There is nice framework and box detail on the inside of the fuselage halves. The prop has separate blades with only depressions on the hub to show where the blades go. Those will need to be drilled out. The kit also requires the builder to stretch some sprue for a few minor items. Instructions are a single sheet of folded paper with 17 construction steps. There is also a short history and parts diagram on the other. Paint information is generic. These instructions are used for all the IK-3 boxings and those that pertain to each version are listed. Color and markings are shown on the back of the box in full color with FS 595 references as appropriate. There are three planes in similar camouflage, differing only in some detail markings. The small decal sheet looks to be well printed and includes the instrument panel decal. The IK-3 has been kitted several times in resin in both scales. Currently, this and one other company (I'm thinking Special Hobby) offer a line of IK-3s in injected plastic. 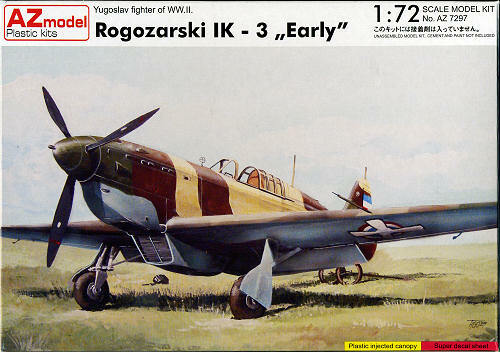 It appears to be a fairly simple kit so should be a relatively painless build to produce one of the few locally designed Yugoslav planes of WWII.